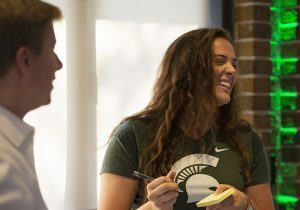 A global ranking of full-time MBA programs finds the Eli Broad College of Business among the world’s best in providing its students and alumni significant pay raises, support in elevating their career prospects and a great value for their tuition dollars. Full-Time MBA students collaborate during the fall 2018 Extreme Green competition. Photo by Zach Hall. Among public programs in the United States, the Broad College tied for first for the average salary percentage increase (of 151 percent) experienced by recent alums, which also placed third globally among all business schools, both public and private, according to the Financial Times. The Broad College also ranked sixth among American public schools in FT’s “value for money” category. “Value for money” for each school was calculated by dividing their average alumni salary three years after graduation by their MBA’s total cost, including tuition, opportunity cost, and other expenses. Worldwide, Broad ranked 27th among both public and private schools. In career services, the Broad College ranked 10th among U.S. publics. FT evaluates the effectiveness of the school careers service in terms of career counseling, personal development, networking events, internship searches and recruitment, as rated by alumni. Globally, the college was 18th against both private and public colleges. Overall, the Broad College finished 14th in its domestic public peer group and 65th among all business schools worldwide. “This is a ranking of global full-time MBA programs, and for us to be in the thick of where U.S. public universities are recognized by this organization, that is critical. And the areas that we stand out from everybody else are in areas that are the most meaningful for students,” said Sanjay Gupta, the Eli and Edythe L. Broad Dean of the business college. 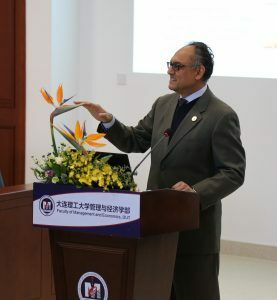 “Whether it is in terms of their compensation packages; whether it is in terms of placement opportunities and the performance of our placement services group; whether it is in terms of the value that is perceived by the students from the program that they participate in; all of these are important metrics by which current and future students measure MBA programs by,” Gupta said. “And for us to perform at this high level speaks volumes about how we present our program and the educational opportunity to current and prospective students,” Gupta said. The FT ranking encompasses the top 100 full-time MBA programs in the world. You can see the full set of rankings at FT’s Web site.